Marc De Dieux is a guitar musician, a massage therapist, a press office, and SuccoAcido magazine publisher. As a massage therapist he works at Casa SuccoAcido, Monreale; visit massaggioebenessere.com to discover more. 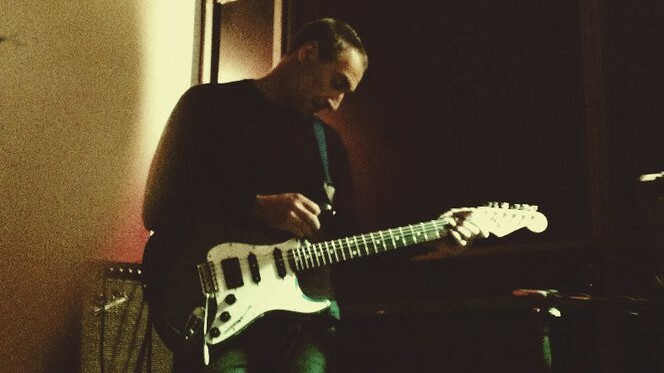 Marc plays guitars all alone or sometime with bands like Istituto No, Two Popes, Full Metal Racket, Quindicidiciotto, Cosmic Eggs, M.I.L., Sbarazzo Magazzini Box and few more guys… but still looking for the right one. Listen his music at the music page… or in the blog. With the bands Istituto No and 15-18 you might listen him in many episodes of The Watt From Pedro Show, Mike Watt’s radio from San Pedro, California. Marc has been interviewed by Marc Ribot too… call it a big “botta di culo”! (read it this same page). Some music from its unprepared guitars can be listen at the music page or in the blog. Note: Marc can’t repeat twice the same sequence of chords or notes… probably. He can’t read any written music and he never studied music. In other words he shouldn’t even touch a unprepared guitar! He usually looks for smiles, not other reasons to play music with unprepared guitars. He doesn’t love to play all alone in a room. Give him a change! Marc Ribot is taking a workshop in Sicily, lesson two. Students are ready to start and some music start. What a surprise for Marc De Dieux, one of the students in the classroom: Marc Ribot is playing Cosmic Eggs CD, where he plays guitar, to the classroom and he smiles. MR: Hey man, I listened to your CD and I tell you what: great staff, seriously. I have to tell you something about it later… Great staff. MDD: I need to go and walk a bit before the lesson start Marc, sorry… I think I’ll have a tea. MR: Very good motifs inside. MDD: Yes, I think so… Funny and happy. MR: How did you play it? Did you study it? MDD: It’s all improvised stuff, played in an afternoon. MDD: They are two hours exactly. MR: Two hours… wow. (They bought smiles). How did you play drums on cd? MDD: there’re no drums on CD. MR: No drums? Who’s playing now drums? MDD: …It should be Giacco’s melodica. No, maybe it’s Nino or me scratching on some string in some way… I don’t now sorry. MR: (watching to the classromm) Tom Waits said that when one now what is exactly playing the music you finished to listen the music. MR: Well… What kind of bass is playing? MR: Good sound. Good sound. How did you recordered the music?